Why not sponsor a War Memorial on our web site? by Cheque made payable to the North East War Memorials Project, The Treasurer, 14 Park Road North, Chester-le-Street, Co Durham, DH3 3SD. Cheques in GB Sterling only please. 1. Are you still researching the names on your local war Memorial/s? 2. Have you published your findings? If so could we have sight of a copy and can you give details as to where the publication is available to add to the NEWMP web site files. 3. Have you set up your own web site? If so we can hyperlink to the web site if you send us details. We would also like you to hyperlink to us! 4. What are you intending to do with your research? Our Every Name a Story section attached to each village or town is a way of making your research accessible to the public. The NEWMP website is archived by the British Library and the results of all your work will be there for future generations. 5. War Memorials files – Do you want your contact details to remain/ to be added to Research in Progress? •	as well as researching names. Our Heritage Lottery Funded film Always Remembered - The North East Memorials of the Great War was launched at St. Mary's Heritage Centre Gateshead on Tuesday November 8th 2016. On 20th March 2019, the total number of memorials in Northumberland, Newcastle and Co. Durham recorded by NEWMP is 4,875. There are also 61 more for which we do not have sufficient information to create a file. This does not include grave headstones, which are in the Every Name A Story section for each place. The total of Every Name A Story entries is 13,143. We want to know location; description; materials used; makers; cost; date of dedication etc. etc. You only have to look at our files to see the kind of information we need. Has your memorial been repaired, resited, upgraded, replaced? Have you sent in the details, plus copies of photos, unveiling programmes, etc.? A history of the 149th Brigade Territorial Battalions of the Northumberland Fusiliers, written by Alan Isaac Grint, is being published this month by Pen and Sword. Newcastle United: “A truly incredible piece of work” which “will appeal to United supporters and non-football fans alike”. 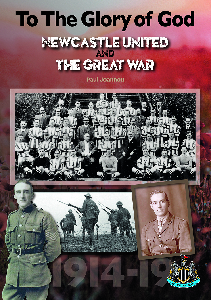 To The Glory of God: Newcastle United & The Great War is published by Novo Publishing Ltd (www.novopublishing.co.uk) in a limited edition. It is sure to sell out so Newcastle supporters should obtain their copy quickly. 240 pages, wonderfully illustrated with over 280 photos. Price £16.99. Waterstones in Newcastle & the Metrocentre, The Back Page in Newcastle & the Metrocentre, Newcastle Library Bookshop and on the nufc.com website. The Parish Council and members of the community have been working for some time to have the names of fallen soldiers added to the Village Green War Memorial. The original War Memorial was Dedicated in 1951. The War Memorial was then moved to its current position in 1972. The works to the War Memorial were undertaken by Art of Stone Memorials. 130 names are engraved on the new marble panels. The project has been made possible through a grant from the County Council Neighbourhood Budget. The Parish Council have also committed funds to enable the project to progress. 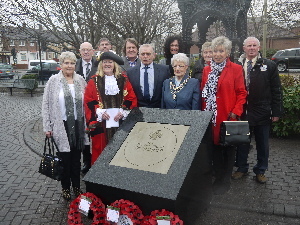 The Rededication of the War Memorial took place on Friday 19 October 2018 at 2pm. The three Churches in the Parish led the service. The Lord Lieutenant of County Durham, Mrs Sue Snowdon was in attendance. The first two hardbacked books from a trilogy have been written by Richard M. Tolson entitled "Stannington For King and Country" and are now available. A third volume is planned to come out in time for the Armistice which deals with the village and those involved in the Great War. In 2018 we commemorate the 74th Anniversary of the crucial "Defence of Rauray" on 1st July - a hard-fought action by 70th Infantry Brigade which brought to an end the Panzer threat hindering further advances on that flank of the Normandy theatre of war. This engagement, part of Operation Martlet, may not yet be so well known as the earlier D-Day battles, but crippled a significant element of some of the best armoured troops available to the Axis forces, and represents a first-class example of close co-operation in ground action between Infantry, Artillery, Anti-Tank Units and Tanks . To read an account of the Brigade's actions, and the casualties sustained, look at the Memorial Website for July 1944, especially for 1st Tyneside Scottish and 11th Durham Light Infantry. For a more detailed appreciation, read Kevin Baverstock's excellent book "Breaking the Panzers". The Brigade was indeed "Faithful." Sunday 20th May marked the 78th Anniversary of the disastrous battle of FICHEUX and MERCATEL in Northern France in 1940, in which so many men of 70th Infantry Brigade were killed in action, wounded and captured, facing columns of armoured vehicles from German Panzer Divisions. 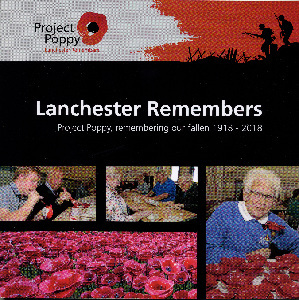 Over the next year we hope to link their Memorial Pages to the local War Memorials on which they are remembered. We will remember them. It is with sincere regret that we have learned of the death, last October, of Colonel Oliver Warman, Welsh Guards - retired. Colonel Warman acted as John Dixon's guide during his research visit to Northern France and Normandy and was of very considerable assistance in navigating to the various locations in which 70th Infantry Brigade was involved in the two campaigns, as well as discussing, in detail, the military strategy aspects. This formed a key part of the HLF-funded project. John had just completed uploading the photographs taken during the trip, together with the associated background information on the various places to the Memorial Website, and had composed a message to Colonel Warman to thank him for his help, and show him the results of their efforts, when he became aware - belatedly - of his death notice in The Times in early October 2017 at the age of 85. Our sincere condolences go to his family and friends, together with our apology for not being aware earlier of his sad demise. The Thomas Young VC Memorial stone dedication service took place on the 27th March 2018 at Boldon. See Thomas Young Every Name A Story entry. On Tuesday 12th December 2017, South Tyneside Council launched their website, South Tyneside Remembers. The Heritage Lottery funded project produced a searchable database, researched by volunteers to commemorate the lives of the men and woman who served during Wold War One. A major milestone has been reached in the research work being carried out into the 70th Infantry Brigade. One of the agreed objectives for the work was the processing of the War Diaries for not only the Brigade, and its three Battalions, but also every other unit which supported the Brigade during its five-year existence. That task, involving typing and uploading some 7500 pages of text, was completed this weekend. Each unit's Diary is accompanied by a list of the men known to have served within its ranks. The supporting units include Artillery, Engineers, Transport, Indian Mule Companies and Provost. Local Family Historians are invited to access the Website and see if any of their relatives served in the Brigade - lead researcher John L Dixon would be delighted to hear from them - contact details are on the Website. Much more work remains to be done, but a key task has now been completed. Thou art for King’s guard at daybreak. And take a place of honour”. Does anyone know where this poem comes from? 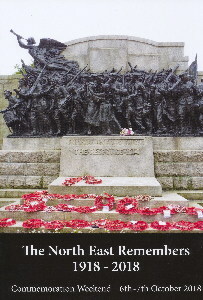 It is used on a number of North East Memorials. We have had several queries recently which are purely on family research. We cannot always help. We are a small group with outside helpers. We cannot undertake to do family research. All the information we have on any one person is on the website, uploaded as quickly as we can after it has been received. Sometimes it is only where he is buried and remembered. There is also an invitation to submit anything to add to this. But we do not have the time to spend doing in depth research. Sorry! 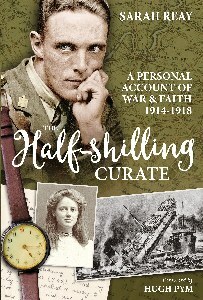 'The Half Shilling Curate' a remarkable true story of the Reverend Herbert Butler Cowl who served in World War 1, written by a relative. This well researched book gives an insight to what chaplains endured along with the ordinary fighting soldier. There is strong evidence that this man was the Chaplain that presided over Lieutenant Philip Anthony Brown's burial service in France when he died after being rescued by Private Kenny V.C under fire. The author Sarah Reay has spent many hours researching this man, and visiting many sites, over many years. A highly recommended read. It includes photographs not seen by any one. A discounted price if the book is purchased via the website Half Shilling Curate and the author might sign it for you. is the title of a booklet produced by the Houghton War Memorial group of researchers. There is a brief history of the memorial, followed by the names and stories of the men who fell. There is also a list of those for whom they could find no information. This nicely produced and well-written book costs £4.99, of which £4 goes to SSAFA and 99p to Houghton Racecourse Community Association. They can be contacted on www1houghtonwarmem@yahoo.co.uk. An item in the Northumberland and Durham Family History Society Journal - 9000 or so photos published on Flickr by Newcastle City Library of local men and women who died or were injured in the First World War taken from newspaper reports in the Illustrated Chronicle. There are also occasional reports of those setting off to war and of their families. Illustrated Chronicle. "Almost Forgotten (Volume 2) The Search for Aviation Accidents in Northumberland" has now been published. Chris R. Davies, Allerhope House Guest House, 2 Walby Hill, Rothbury, Northumberland, NE65 7NT. This is a well written book. At the beginning it is stated quite clearly that it is not a military history of the Battle of the Somme. It is about the 72,000 young men involved who never returned, and whose bodies were never found. It explores the reasons for the memorial’s erection, the building of the edifice itself, and explains the layout. It tells why, despite so many fatalities and woundings, the battle paved the way for eventual victory for the Allies. The book is also designed so that visitors to the memorial can find the names on each face and read the story. Pam and Ken Linge have spent ten years working on the records of all the men named on the Thiepval memorial, prompted in the first instance by the discovery that Pam’s family had lost members during that battle. This book is a credit to their work, and helps to bring home the individual cost of war of each man and family involved. For most people, the emphasis of the Great War has been on the men who fought in the trenches. We hear little about the men who served on the high seas, with either the Royal Navy or the Merchant Navy. For some time now we have been compiling a list of ships and the men from the North-East who served in them. This is merely just that - a list - and when we have an "Every Name A Story" page for a man, this has been added to the list. There are a lot of names for which we do not yet have the "Every Name A Story" information. The lists can be found under "North East Notes" accessed from the Home Page on the left hand side. If anybody wishes to add anything, or do any work on this aspect of the war, please contact janet@newmp.org.uk. Shall we not offer up our best and highest ? When duty calls can we forbear to give ? “He gave his life that England's soul should live." If you help, this would be very useful. The only instances of it on the Internet do not give the author.